As early as Monday, Arpee informed about an event that was brewing on Thursday. It was a beer event, a beer appreciation event at Red Box. The guy’s been inviting me to all of these blogger events, but I never had a chance to go because either I have a dolly meeting or I have more important personal matters to attend to. But this time, I’m not letting such an opportunity pass by. 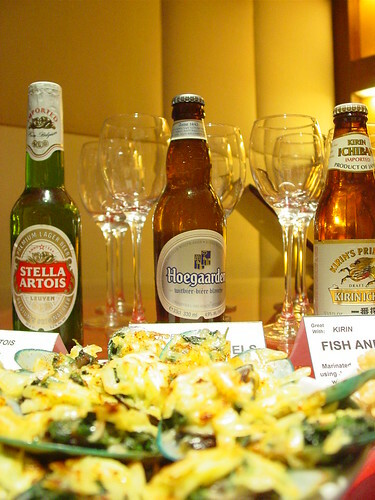 A chance to drink different beers around the world saves you some cash from traveling around the world just to taste them. Besides, if this gives a glimpse of what the Institute of Brewing and Distilling has to offer, then I’m up for it. And I’m so happy that I didn’t miss this event. I’m not entirely an avid beer drinker. I have mentioned to Arpee that I’ve got a weak spot for beer. I can go all night drinking Spirits and Wine, but beer is something else. With 3 bottles, I’m probably incoherent. Thankfully I wasn’t driving that night, so I barely had any problems. However still, the idea of having to drink myself silly that night just to taste different beers scared me. Thankfully, all we got were samplers. A renowned British chef (whose name escapes me) guided us through the tasting. The event was rather packed and the tasting seemed to be placed to speed so the waiters pretty much poured us dribbles ever 2 minutes or so. I’m familiar with the basics of wine and coffee tasting. However, I wasn’t so sure if this was applicable to beer as well. Since the guy didn’t mention of any technique (he only said take time to taste it) I pretty much let the beer swirl around my mouth for a bit and then swallow. It wasn’t much of help since I realized later that tasting beer was similar to how you taste wine. It involves some swirling of the glass, a sniffing of the beer, the slurp, the gurgle, and the swallow (or the spit if you don’t wish to get drunk.) I think it would have been more interesting if there was time to really go through the tasting process and to distinguish the flavors. The only thing I learned from the lot was “The essence of the beer is its water. Drink it chilled and without ice because only then will you taste the water.” A very helpful tip, perhaps one that could be useful to our family drink outs. Anyway, they served our group around 6 beers, all of which had very distinct flavors which I didn’t realize beer ever had. Here’s the rundown. 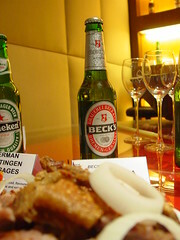 Heineken – A very good straightforward German beer that had a nice crisp texture and light tartness. It was very smooth to drink. I will consider this the pre-WWI beer. Very nice and clean impression of German beers. Beck’s – Another German beer that had a far more complex flavor than Heineken. So this would be my post WWI beer. It’s bitter without being difficult to drink. To me, it even had a slight sweetness for a beer. I find this beer very manly. If beers can be manly. 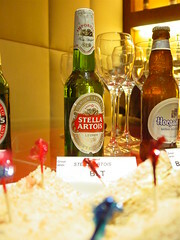 Stella Artois – A Belgian beer described as Belgium’s table beer. It was clean to the taste but it still had that small tartness of beer. I don’t know if that tartness is actually related to the malt and the beer. I think I understand why this beer is a table beer. Because of it’s mild flavor, you can eat it with anything. 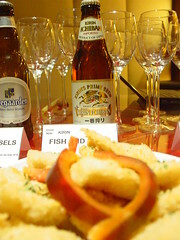 Kirin Ichiban – A Japanese beer which I believe is the reason why we see a lot of Japanese salarymen out drink with neckties over their head. The beer is too clean that it tastes like water. I think it would take a couple of bottles before you can even taste that malt. Maybe because Japan’s water is too clean. However, after the first three beers, I think I understand why Japanese men prefer drinking San Miguel. I wonder if Asahi or Yebichu are the same. Hoegarden – A beer with a hint of coriander. NOT! It tasted like fizzy coriander juice! I can be harsh about this but it tasted awful. The coriander was too strong and I don’t think I’d even drink another sip of this (in fact, I threw the rest of the drink). According to the chef, this was such a beer that is enjoyed by women. I’m a girl but… well… another female attendee liked it. Maybe I really have a more manly taste on things. At most interesting, but never again. 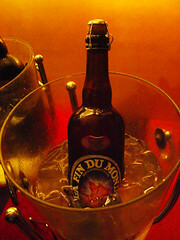 La Fin Du Monde – A very expensive beer no longer produced in the world. Apparently, it’s award winning too. What is interesting about this beer is its triple fermentation. It’s also considered vintage which is something I’ve never heard of in beer. The beer tasted like a heavier version of champagne, without the sweetness or the acidity of grapes. If champagne was stored for a century, it could have tasted like this. They offered some food pairings. Had a chance to taste only baked tahong (mussels). It was yummy, but wasn’t able to match it with beer. I wish I had a shot to really take more time to study the pairings and see what matches with the beer but time flies by when you’re buzzed. I wasn’t honestly buzzed though since we only had sips. 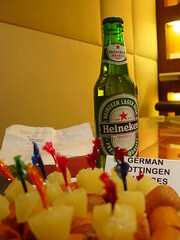 We had a chance to drink the beer afterwards but I didn’t bother because I had eaten so much of the buffet. The night ended with a sweet swag of bringing home your favorite beers. To the organizers and Red Box, it was a pleasant experience. Apparently, Red Box is bringing in these beers for their karaoke-goers to taste. I don’t think I need beer to sing karaoke, but it’s nice to know that you have an option to drink these beers in their club. They’ll also be introducing some beer of the month bit which is sweet. Bah! your first blogging event and I wasn’t there! kala ko nandun si nina eh. sorry po! boto ko yang si nina for the travel blog category sa PBA!